When I am truly sick I don’t want just chicken noodle soup. I want one of the gingery chicken dishes I grew up eating when I was with the Filipino side of my family. Jonathan (The Canary Files) has a wonderful Tinola-Style Cabbage Stew that really takes me back. Even though Jonathan’s stew is vegan, it’s the ginger that does it for me. If you’ve been following me for a while, you already know how much I love ginger and I try to keep my use of it toned down in recipes because not everyone likes the fire-y heat of a lot of ginger. However, ginger in a soup or stew sings comfort and my many grandmothers to me. I feel like I’m wrapped up in one of Grandma’s or Lelang’s (my great-grandmother) quilts. Perhaps it’s fitting that I share this recipe now. It was a year ago I took the picture of Grandma’s kitchen. A year ago I flew home to be with my family as we buried her and said goodbye. 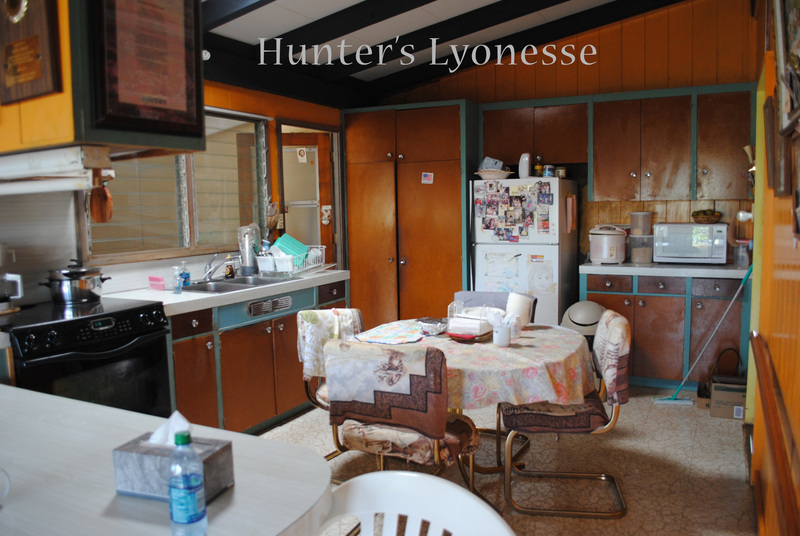 I can’t count how many times I ate at that little table or how many times I washed dishes at the sink. I can tell you I only burned my hand on the old stove (not the one in the picture) once. The coil was bright red and calling my name. My hand was on it before my aunties and uncles could stop me. Some lessons only need to be taught once. Right? Chicken Papaya and Chicken Long Rice are two dishes I crave. I had the idea to combine the two because I wanted the green papaya and the “long rice.” It seemed silly to make both dishes when I could make it all in one dish and have a nice hot bowl of soupy goodness. I’m rambling. My head is silently editing my next piece for Chocolate Wasteland while it is crafting this post. I’m talented like that. Sometimes. A few notes before I get to the recipe. If you can’t find green papaya, use chayote squash. If you live anywhere near a Jungle Jim’s, that’s where I get mine. It is so green the flesh and seeds inside are white. They didn’t have any when I made this version of it so I went with the unripest papaya they had. Also I used rice threads in this, but I normally use mung bean threads for a nice translucent noodle. It is important that you use bone-in chicken thighs. The bones help develop a clean hearty broth. Heat a large pot on medium high heat. Add the oil and coat the bottom. Season chicken with salt and pepper then add to the pot. Brown the chicken on both sides. Add the ginger in between the chicken thighs when you turn them. Add the green papaya, patis, tamari (or aminos), and enough water to just cover the chicken and papaya. Turn the heat down to medium low and simmer for 20 – 30 minutes. The chicken should be starting to fall off the bone. While the chicken and papaya is simmering, soak the bean/rice threads in boiling water for 7 minutes and drain. Add the noodles to the pot the last few minutes of simmering and stir in well. 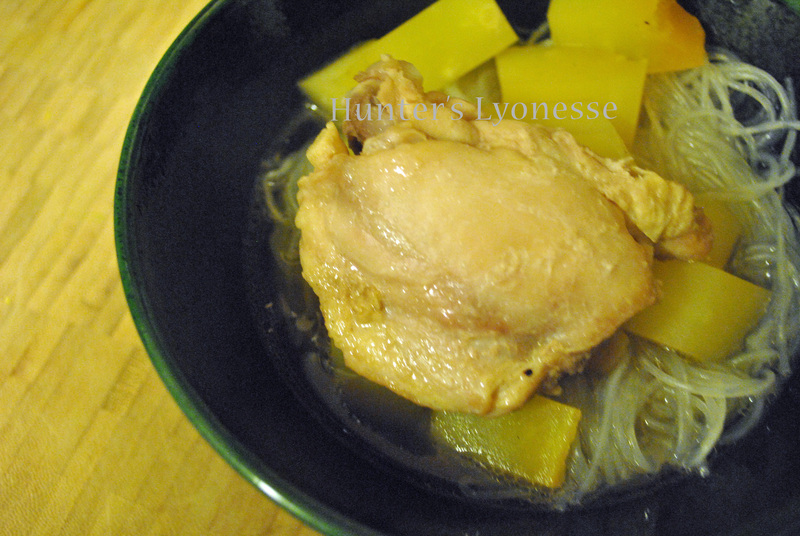 This entry was tagged bone-in chicken thighs, Chicken Papaya Long Rice, ginger, green papaya, mung bean threads, rice threads, wheat-free tamari. Bookmark the permalink. Yes, me too! I mean this is the kind of recipe I want when I’m sick. Which I feel slightly now. 😦 Can’t figure out if it’s a food reaction (which often feels like the flu to me) or I’m actually getting sick. Either way, I’m going to bed early! After I pretend I’m eating your soup for dinner.